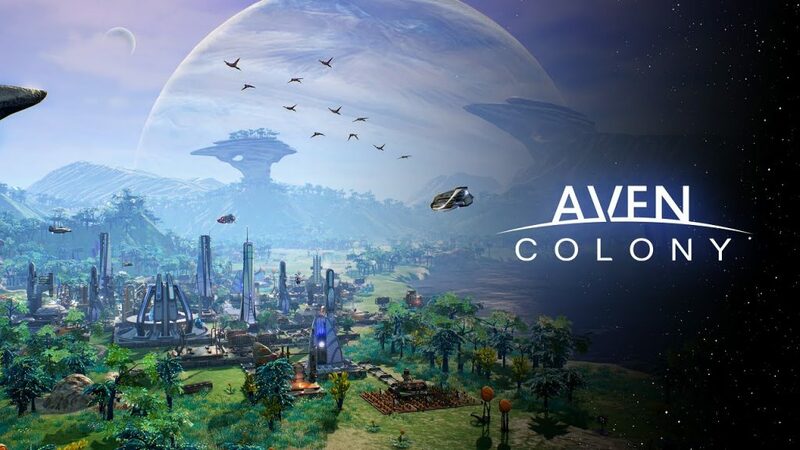 Aven Colony sees you installed as Governor tasked with building a human colony on an often hostile alien planet called Aven Prime. Pitched as the last great frontier for humankind to conqueror you are part of a larger effort to build a sustainable home for the people aboard a huge colony ship. You can choose to play in Campaign or Sandbox mode. Sandbox allows you to set a number of parameters to increase or decrease the difficulty of the level, but otherwise you are left to your own devices to plan and build how you see fit. Campaign mode is slightly different, with several missions spread across the various locations on the planet. Each mission gradually increases the difficulty levels with restrictions on space for placing buildings, or environmental restrictions in terms of the viability of the land for crops and the abundance of water. The emphasis is very much on survival rather than pretty town planning, but as you progress into the campaign you will need to deploy some forward thinking in terms of maximising the natural resources available to you in order to make your colony a success. There is a loose structure to the campaign to explain why you are moving around. Your first mission sees you just establishing a colony in a rich, fertile area. Prove yourself in that terrain and you will be asked to move to Sandy Gulch, a dry, arid place with very limited fertile land and even more limited water. Your task in Sandy Gulch is to build a mining colony that serves the other colonies in terms of mineral resources and provides a base for expeditions to search the planet further. The third mission is in a frozen wasteland where no crops grow, so you must build the colony based on trade with the other colonies. Interspersed with the loose objectives you are given in each area are voice communications that flesh out the story a little more. These interjections into the campaign are a little cheesy and underdeveloped, but do help to give you some sense of purpose and meaning to what you are doing. City Builders work best on PC with the greater flexibility for multiple controls, however Mothership has done an excellent job of designing a system that works well on controller. The controls are fiddly at first with seemingly a lot of functions mapped across the various buttons, but the menu system is well set up and you can pause the game at any point to set up a chain of commands to start when you increase the game speed again. The only criticism I do have is that the camera is really fiddly and feels counter intuitive at times with the left stick moving the camera around the map and the right stick controlling the lateral and vertical movements. Furthermore, you can use the bumper buttons to zoom in or out to get a bird’s eye view of your colony. The default difficulty is set to Normal and for the most part the difficulty is pitched to give you a fairly relaxing and stress free time. As you proceed further into your time as governor of the colony things do start to get a little more demanding with storms that can damage buildings, and disgruntled colonists moaning about the lack of transport routes or the poor air quality. Towards the end of your time on a particular mission things are thrown at you at increasing pace with disease breaking out, or damage to energy production which means mills are shut down and food production becomes scarce. Thankfully, in really hectic moments you can pause the game and set up a number of actions to mitigate the events before pressing play again and seeing things out. 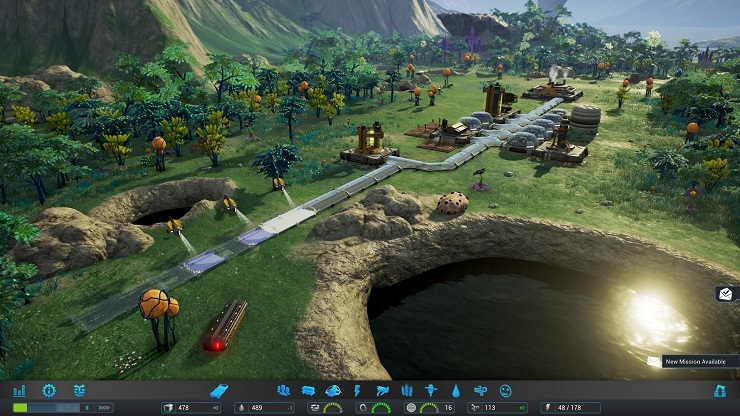 For the most part you can play at your own pace; you are given some loose objectives such as attract 200 colonists to your base or to place 5 mining structures or to ship 300 Rice in exchange for Nanites (the building currency you utilise to purchase buildings). 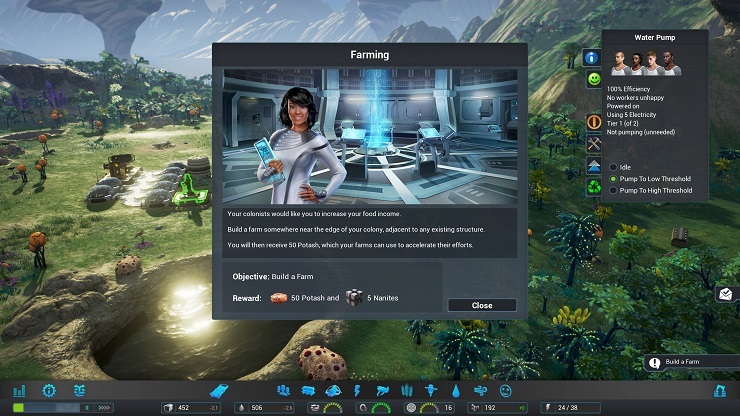 The missions serve to give you some direction in you colony building, but you will still need to make some judgements on what is best for your colony in order for it to survive in the longer term like ensuring that there is enough storage for your resources to be kept in, and that there is enough power being generated to keep all your research and food production units functioning. Aven Colony is a pleasant and, for the most part, relaxing City builder. The emphasis isn’t on pretty town planning however, rather you are tasked more with survival in an alien and often hostile land. The alien planet makes for an interesting locale, but the reality is that your colonists will have the same concerns as those from other City builders, namely fresh water, food, crime levels as well as transportation and entertainment. The accessibility of Aven Colony should be commended, however it does come at the penalty of depth with each mission following the same pattern. The campaign takes you across the planet, providing increasingly challenging objectives, but in truth the default difficulty setting will rarely challenge you too much. Increase the difficulty though and you will find yourself pondering the merits of drug production to keep your colonists compliant if a little less productive. Aven Colony is a gentle city builder where you will be tasked with growing colonies in different locations each with their own challenges. Where it lacks in depth it more than makes up for it in accessible gameplay, perfect for dipping into.